Female surf scoters have a vertical white patch near the back of the neck. 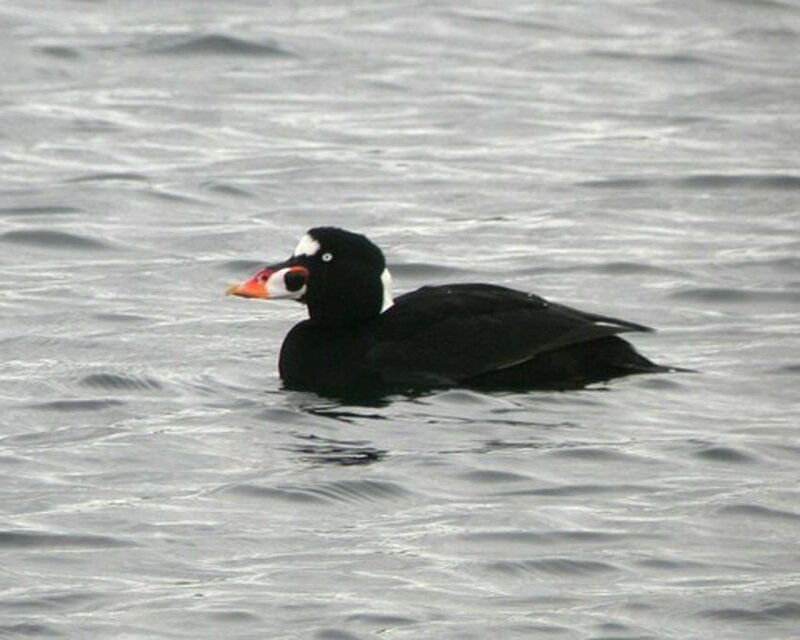 The male surf scoter has a multicolored bill and bright white head patches. In order to see all the waterfowl that migrate through the Upper Clark Fork drainage you need to wait until October to get the last three, all in the same genus Melanitta, the scoters. All three breed in Canada, Alaska and Arctic regions on freshwater ponds and lakes. They migrate south in October and November and winter along both coast in the oceans. We only see them in the fall as migrants in our area. The casual birder may never have seen any of these rare fall migrants —surf, black, or white-winged scoters. Most sightings are found west of the Divide and a good portion of these sightings come from the Upper Clark Fork drainage at Warm Springs WMA, Silver Lake, Georgetown Lake and East Fork Reservoir. The general explanation for this is that scoters like deep water where they dive for mollusks and snails. Any individual bird typically stages for 7 to 10 days for rest and rebuilding fat reserves before continuing on to the coast. The black has only been recorded 23 times, the white-winged 100 times and the surf 107 times across Montana. The fall of 2018 was outstanding for viewing scoters in the Upper Clark Fork. This fall I observed the black three times, Oct. 8, 11 and 30. My other two sightings were in October 2011 and October 2012. I observed the white-winged scoter four times in 2018: Oct. 15, 20, 30 and Nov. 6. In the past I had seen it 18 times in Montana. The surf scoter — the most common in Montana — gave me 31 sightings in the past. This year I saw surf scoters 18 additional times. Of my 49 sightings, 37 percent of them were this year! My first sighting was on Oct. 8, then Oct. 11, 20, and 30. Each of these sighting I believe to be different birds due to location and date. Then the strangest thing happened. On Nov. 3, I found a female surf scoter at AR Pond 2 at the Warm Springs WMA. On Nov. 6 I saw the same bird in the same area associated with American coots. Since then I have seen this individual 14 more times in the same area associated with American coots in a small area of open water surrounded by ice. Posting this to ebird, I got a notice that the sighting was infrequent on Nov. 15 and rare every time there after. This individual bird stayed in the same location for 46 days. There are three previous December records for the surf scoter in Montana, Dec. 10 at Lee Metcalf NWR, Dec. 17 at the Great Falls CBC, and Dec. 23 at the Bighorn River CBC. Only two records are in the spring in May, all of the rest of the records are September through December with the most in October. Unfortunately, the last time I saw the surf scoter was Dec. 18. This was just five days short of the latest record, but was the second-latest sighting for December. Scoters are easily distinguished from other ducks as their bills are much heavier constructed and shaped differently than other ducks. Males and females differ substantially in all three species. Males of all three species are also easy to tell apart. The surf, pictured with this article, has a multicolored bill and bright white head patches. The black is all black with a yellow knob on the bill, and the white-winged is black with a yellow bill and a white “comma” patch below the eye. Males of these species are beautiful birds and always bring excitement the first time you see them each fall. Females look more alike, but with a little effort can be distinguished. Surf females are brownish-black with a vertical white patch at the base of the bill and a whitish patch near the back of the neck. Black females show a dark cap and clean pale white cheek, reminding you of a female ruddy duck. The female white-winged shows extensive white between the eye and bill and the white secondary wing feather are visible. If you are interested in seeing scoters next fall, Silver Lake is the most reliable place to find them. Begin making trips to Silver Lake about the second week of October and continue doing so until the lake freezes over. Park, with your car facing east along Montana Highway 1 on the north side of the lake and glass the water along the dam. If you do this once a week you will be sure to see surfs, and most likely white-winged. 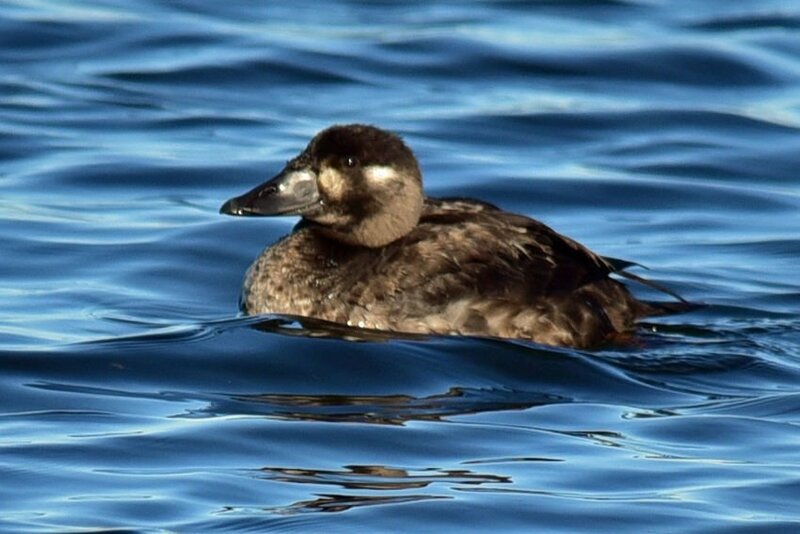 If you are really lucky you may even see a black scoter. Be sure to have your field guide with you so you can distinguish females and juveniles. They are much more common than males in our area. Gary Swant of Deer Lodge taught biological sciences at Powell County High School for 25 years. After retirement he founded GoBirdMontana, www.gobirdmontana.com, an environmental consulting and bird guide service. He can be reached via email at birdmt@charter.net. This column features bird species of the Upper Clark Fork River Valley from Butte to Garrison. Swant hopes the column will inspire people to take an interest in observing birds.